We are always using items from the recycling bin to make crafts with, we have loads of egg carton and cardboard tube crafts, but I haven't used glass jars before because of the risk of the glass breaking. 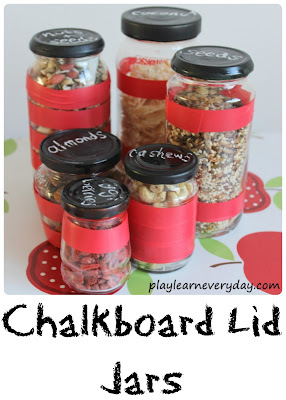 But I decided to give it a try under supervision, and just use the lovely finished chalkboard lid jars myself! Once the jars were clean and dry (I put them through the dishwasher to make sure that they were really clean) I used a paintbrush to put on a coat of the Rust-Oleum Magnetic Chalkboard Paint. It was easy to use and apply, it went on smoothly and dried fairly quickly. After the first coat had dried I put on a second coat just to ensure that the lids were completely covered. Then I left the lids to dry overnight to ensure that they were completely dry and ready to write on. I decided to decorate the jars with red electrical tape rather than washi tape as it's much stronger and waterproof, so these jars can still be washed and reused for a long time to come. The kids loved wrapping the electrical tape round and round the jars. It's fun for them and great for developing those muscles in their hands to prepare them for writing. I let the kids use as much tape as they liked and decorate however they chose to. It was also a great way to cover up any of those sticky spots of glue that wouldn't come off the jars. Once the paint was dry we were ready to fill our jars with all sorts of different things and use chalk to write what is inside on the lids. It's a fantastic way to sort out your kitchen cupboards, I've used this set of jars for all sorts of healthy nuts and seeds. I think that our next batch of jars will be for craft supplies! 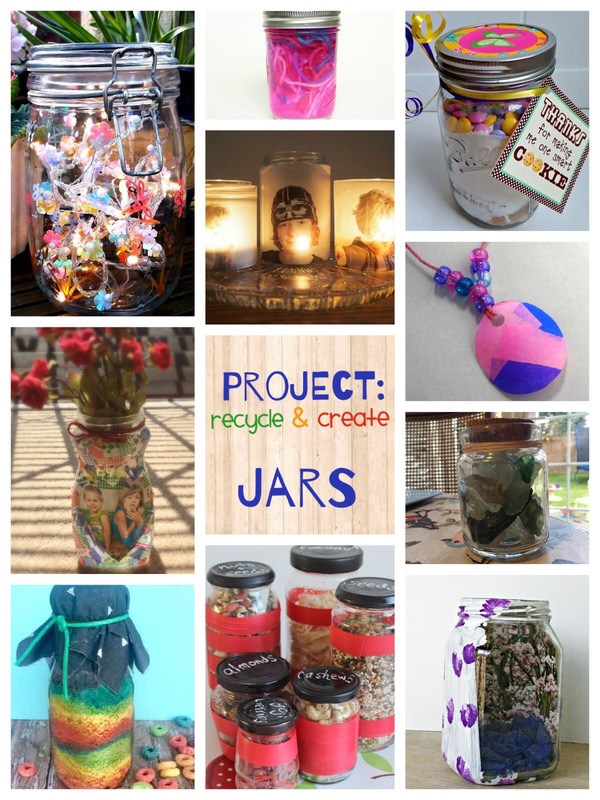 This post is part of a Project Recycle & Create blog hop of ways to reuse jars, check out all of these great ideas! I can see this idea being great for some craft supply storage, too! Awesome idea!